Welcome to our Philadelphia Women’s Theater Festival Spotlight, where we profile the great people involved in this year’s festival. From the founders to the playwrights and directors, we are going to discover all of the moving parts to this amazing festival that is all about giving opportunities for women in theatre. Meet Christine Petrini and Polly Edelstein: The founders of the Philadelphia Women’s Theater Festival! Christine serves as the Managing Director while Polly serves as Artistic Director. 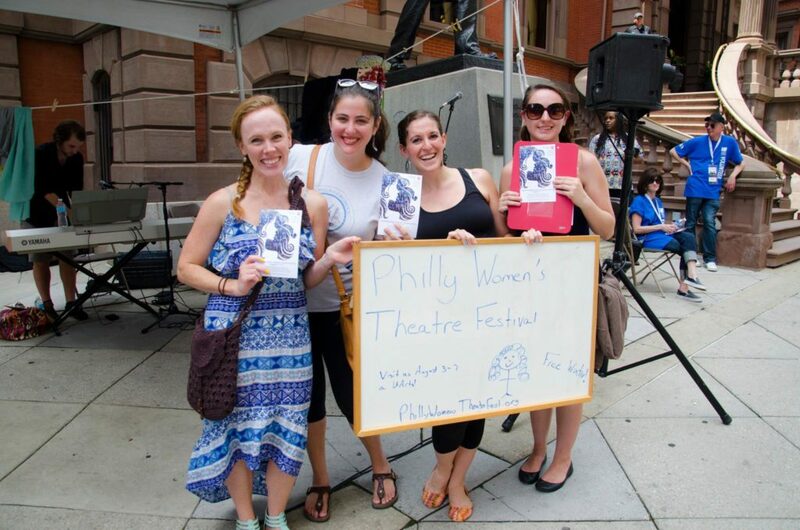 How did you first get involved in the Philadelphia theater community? Christine: I originally grew up in the suburbs of Pennsylvania and left for college but ended up transferring to Temple and ended up in Philadelphia. I became the graduating director of development for Media Theatre and had the opportunity to have a role as an actor, the Buddy Holly story, and as a result I fell back into the passion of performance and spent some time on the road in Japan and other places performing. Coming back I relocated permanently and have been here ever since. It was really the start of my time at grad school at Villanova placing my roots as an artist in Philadelphia and an opportunity for me to form a network in the city and the greater Philadelphia area. It’s a place I can call home and get to know the community in a deeper way than when I was going at it alone. Many of the graduates at Villanova are entrenched so we have our own network and family – it worked out the way I had hoped. Upon graduating, Holly and I ended up starting the festival where my life and my roots are. Polly: My first work in the Philadelphia theatre community was as a teaching artist with Theatre Horizon (and I still teach with them to this day, they are an amazing organization!). I had just moved to Philly and knew I wanted to get involved with as many theater companies as possible and Theatre Horizon was looking for teachers and also were so warm and welcoming to me even though I was very new to the city. Since then I’ve worked for a number of area arts and theater companies including Simpatico Theatre, the Darlington Arts Center, Steel River Playhouse, InterAct Theatre Company, the Pub Theater, and a few others. What do you love most about Philadelphia theater? Christine: One of my favorite things is that it’s groundbreaking and it’s intimate. It’s different than New York in the sense that it’s new work that might make it’s way to New York. It’s fringe, innovative in terms of techniques, and it pushes boundaries in terms of themes. PWTF for example is a break out of traditional molds and provides leadership roles. We find universal and human stories, it’s super accessible and lives within the city and throughout the suburbs. You can go into Philly and find great theater and the suburbs, all of it doing new and groundbreaking work. Polly: Oh man, this is a tough one because I want to say everything but that feels like a bit of a cop out. I think the thing I love is the commitment of much of the greater arts community to being proud of this city and its talent. There are so many talented actors, directors, designers, stage managers, and more in Philly and they are committed to doing their fabulous work here and making the city richer and more arts centered than it’s ever been. I think most people recognize and appreciate that and realize that some of the most talented artists in the country call Philly home. What was it like creating the first PWTF? Christine: It was enriching and challenging in ways that I could have foreseen and other ways I may not have imagined. What was exciting and rewarding is that people were interested from the first moment, that showed to us that there was a need. The need and the interest existed, to be a part of the movement at its ground level, at its beginnings, to bring women into theater as leaders. We received well over 100 submissions our first year so right away we felt that excitement – we were really committed to developing the program internally. We had a series of meetings that we called “braintrusts” – getting people into a room and talking to them about what we should be doing and how. We did this before putting out a press release so we could present ourselves as a sustainable organization, something that was going to come to Philadelphia and stay. Polly: It was insane but also deeply rewarding. Christine and I completed our MA in Theatre at Villanova together in 2014 and a few months after that I asked her out for a drink and was like “hey I have this crazy idea, want to help me make it happen”? That was in November 2014 and our first festival was August 2015. I think the most challenging part was getting it off the ground and figuring out exactly what and who we needed. We still navigate that challenge as we attempt to grow and scale the organization. What were the most challenging/rewarding aspects? Christine: One of the challenges during these braintrusts that we had were that the room was full of both realists and idealists. The first year was a series of compromises. Polly would say the same thing – we made these compromises with these big ideas, starting small, quality over quantity, and then building out over time. Year 3 is exciting – women’s playwriting cooperative, Hear Me War, over a 5 day festival. With a lot of different ideas and opinions about creating a working relationship, it’s so important to listen to each other. One of the best things that was ever said to me was “Spend less time being fascinating and more time being fascinated by others.” A lot of what we are doing is a learning process and a learning curve, we are only as good as our collaborators. All of us are juggling 10 jobs but we want to be professional and structured. Asking yourself “how do I wear all the hats at once?” is a really exciting challenge. Polly: There are so many rewarding aspects but for me I think the most rewarding thing is to be able to specifically give women playwrights and directors a platform. We’ve given a lot of early career women directors and playwrights their first professional show and it has lead to success in their future endeavors. In Philly and across the world women are underrepresented as playwrights and directors and it feels good to do our part to try and change that. What was your favorite production in Philly this past year? Christine: My favorite thing was a new play called The Elementary Spacetime Show, a brand new musical written by César Alvarez. One of the cool things is we were still in the early process with Sarah and Jaime (the authors of Hear Me War), and I sat down in an early production meeting about how overwhelmed I was by this new musical, and they had mention how Alvarez is one of their greatest mentors. I didn’t realize the direct affiliation, it was a cool thing to learn. It’s excited to see how we are all connected. The Elementary Spacetime Show breaks away from the traditional musical sense and leaves you with a song on your tongue and a message on your mind. It’s full of spectacle and takes a look at the universe and takes you to another worldly place, but hones in on a message. Polly: The Seagull at EgoPo. I was so cranky going into the show as it was at 8pm and I knew it was at least 2 and a half hours and I had a head cold and had seen a not great show earlier that day and Chekhov in general is not my favorite. Needless to say, I was blown away. Which female artist inspires you most? Christine: Anna Deavere Smith. She found a great love of solo performance and that’s what she’s known for. I had an opportunity at the Kennedy Center and she spends a lot of time interviewing people she will take on as a solo performer – every gesture, every facial expression. It’s such a transformative nature, to live in another person’s body. Polly: Oh gosh, so many, but I think Ellen Stewart will go down as one of the most inspiring artists I’ve ever had any sort of contact with. Experimental work is not something I find I am well practiced at yet but I have such respect for how she trail blazed a path for herself and for so many especially as a woman of color doing theater in NYC in the 1960s. What are you looking forward to most at this year’s festival? Christine: I’m really excited to have the opportunity to have a show play multiple performances throughout the five day festival. It will be four shows and one invited dress, it has time to live and breath in the space, to generate some excitement about the performance, giving the actors the chance to live, to watch it grow and develop this whole summer. I’m excited about the process, the past was more presented work. This year we are producing something, there is such joy in that process. I’m excited to see our growth and celebrate year 3, about the diversity of our cast and to represent the whole community, we can represent all races, genders, and sexual identities. Polly: Everything about HEAR ME WAR by Sarah Galante and Jaime Jarrett! By the time the festival hits we will have been working on this for over a year and I cannot wait to see all that work come to fruition! Looking for a PWTF festival pass? Get one here or click here to donate to the great cause.